I got married August 2015 to a man I had dated for less than 6 months. Last year I literally lived out my 12-year-old-Casey dreams of meeting a great-looking, godly guy, falling in love, and getting married ASAP. I love my husband and I love being married. Jon is not perfect, but he's embraced husbandhood with humility and passion and a ton of effort. He loves me more than I ever thought humanly possible. However, it may surprise you to find out that I - a newlywed, pre-kids, pre-stretch marks, and definitely in love with her husband - still struggle with insecurities. As a single gal, it was easy to expect that the love of a man would dissolve my insecurities, or at least cause them to diminish. "Once I find a man who loves my body completely, I won't feel ugly anymore." "When I find a man who loves my personality, I won't feel so weird or awkward." "I won't feel like a failure in the arms of a man who doesn't expect me to be perfect!" But even though Jon loves me, he'll never think I'm perfect. And he shouldn't, because I'm not. And even though he loves me more than anyone on the planet, he isn't perfect either! However, my insecurities are meant to be dissolved by a perfect love... just not a perfect human love. 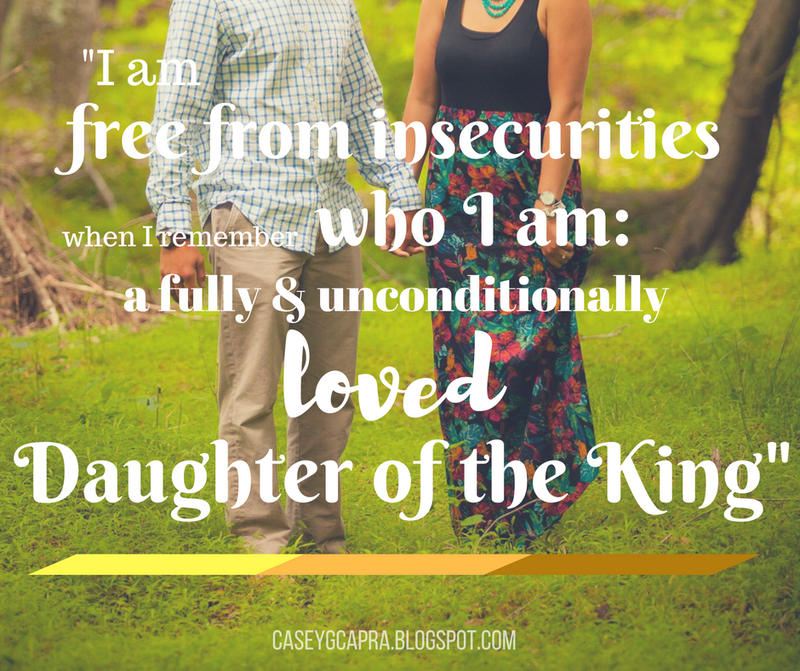 Insecurities truly stem from not understanding how passionately and completely our Heavenly Father feels towards us. We all long for a hero to risk death to save us, and still ignore the face that we've already been saved by a man who defeated Death Itself! I am finding that I am completely free of all my insecurities, not when I remember I am a very loved wife, but when I remember I am a fully and unconditionally loved Daughter of the King. So you see, the source of all your insecurities actually is all about being crazy loved by a Hero, but the source of your freedom comes from knowing you already are. Girl, this is such a great post! Thank you for sharing your heart with us today. You are such an inspiration!! Casey, this is great! We need to remember the unconditional love we have in Jesus. I pray this reminder gets to the people who need it most. Thank you for sharing with Thankful Thursdays. Love this! I have also learned that insecurities won't be diminished by another human being. Realizing my worth and confidence in Christ has been one of the best decisions I have ever made! Just saw your blog on Holly's and wanted to pop over and read! I loved this post you shared... thank you for the encouragement. I've been married 1 years & have 4 kiddos and your post still rang true to me! 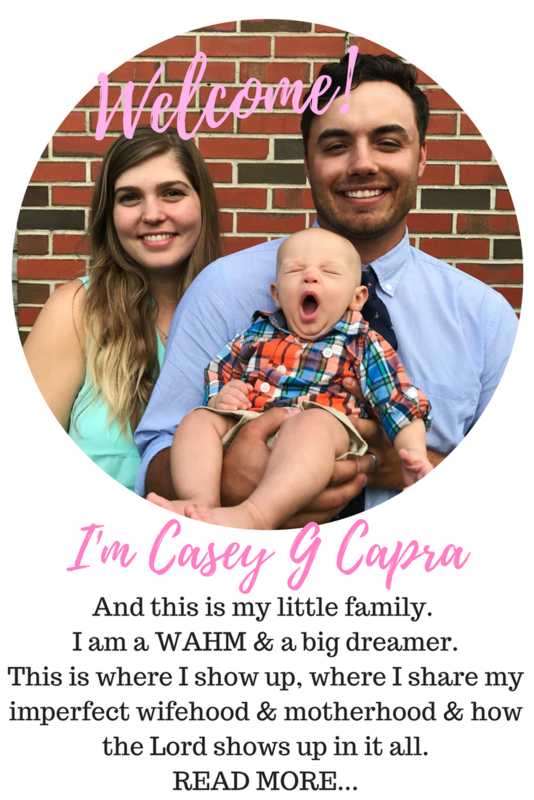 Casey, this is such a great post! 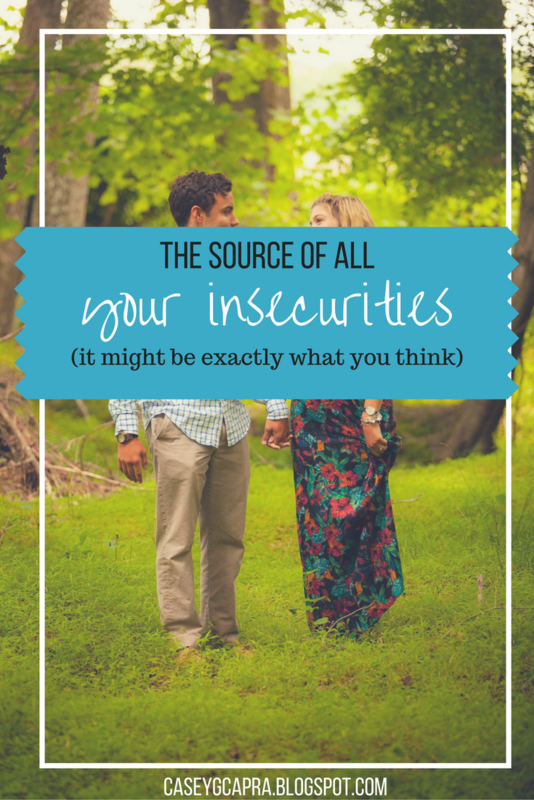 I tend to struggle with insecurities and perfection, so this post is so encouraging for me. Thank you for always writing what God has put on your heart. It matters. Such a beautiful lesson to learn. It's something we "know" but when that message gets in your heart it makes all the difference in the world. Thanks for sharing!